Our NannyFusion member, Nanny Transitions, shares a great article about “What a Nanny Would like on her Last Day With Your Family“. 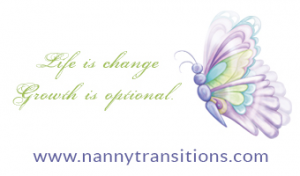 Glenda Propst who is one of the original Regarding Nannies development team members, is the force behind Nanny Transitions. She presented a workshop called “Gentle Transitions” back in 1999 at the National Association of Nannies (NAN) and has recently presented it at the International Nanny Association conference as well.